I wanted to throw in a street style shot between fashion show posts, mainly because I still have to edit the photos from the Fanshawe show last weekend. 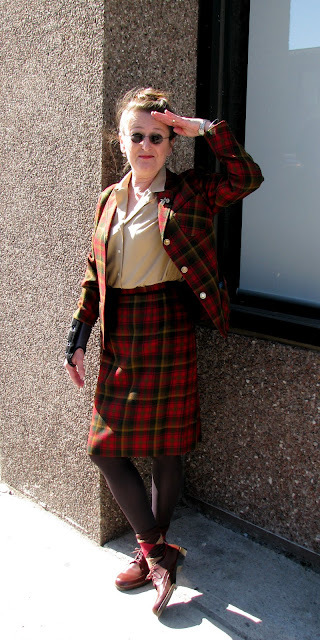 I ran into my friend Virginia on a very sunny day, and she was wearing one of the vintage gems from her wardrobe - a Maple Leaf Tartan (a Canadian plaid!) jacket and skirt, which inspired some patriotic posing. She put a modern, funky spin on the suit by pairing it with argyle socks and lace-up shoes. She looks great. I would've wanted to take her picture too. The shoes and socks complete this outfit beautifully! Virginia is definitely wearing a vintage gem and has the perfect pose to go with it. She is Miss Marple remixed and lots younger of course! Love the argyle and lace ups , perfect details to make it work!